It took 11 matches for Steve Westaway and Simon House to lose a match and now they have lost 2 in a row…. But by how much? 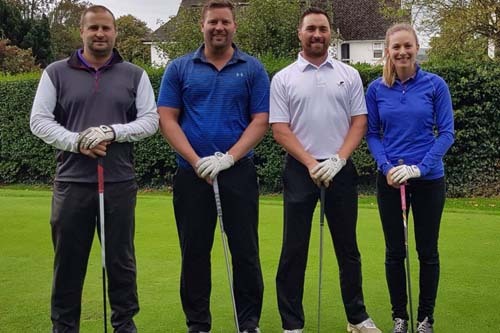 On Monday 2nd October Steve and Simon took on fellow Exeter Golf and Country Club members Hannah Armstrong and Jon Mitchell from Thomas Westcott Chartered Accountants. With handicaps of 3 for Jon And Simon and 7 for Hannah and Steve it was going to be a close and competitive match. The first hole was halved with pars from both teams and the first birdie of the day came from Simon on the 2nd to take the hole, only to be cancelled out by Jon’s birdie on 3rd for the match to remain all square. It took until the 6th hole to split the teams again with a par from Steve to put AME 1 up. However the front 9 finished all square with a fantastic par from Hannah on the 9th hole. Hannah followed up with another par on 10th hole with a shot to put Thomas Westcott 1 up for the first time. A par from Simon on 11th and a birdie from Steve on 12th was enough to win both holes and put AME back in charge and 1 up. However another birdie from Hannah on the 13th made it all square again. Pars from Steve and Simon on 14th and AME were back in front again, only to be cancelled out by a great par by Hannah on 15th. All square and 3 holes to play. The par 3 16th was halved and Hannah sunk another birdie on 17th to put Thomas Westcott 1up once more and only 1 hole to play. They needed to win the last hole to take the top spot and replace Mark Stanley Harris and Derek or half it to force a playoff to be crowned 2017 AME Match Play champions. Hannah hit her 3rd shot in the water, but with a great chip and putt managed to make a bogey 6. Was that going to be enough? Steve had a lengthy par putt that just missed and secured the half so it was down to Simon with a 10 footer for par. Hole it and match would be halved. Miss it and Hannah and Jon would be in the playoff. The delight could be seen from the club house as the ball drifted to the right of the hole. What a fantastic match that went one way and the next. Hannah and Jon win the match 1 up to match Mark and Derek, so a playoff is in order to find our champions and the winners of a new tablet each. The playoff will take place in Darren Everett Golf studio here at Exeter golf and Country Club, where we will have a nearest the pin challenge to find our winner. Thank you for everyone that took part this year (Dave Richards, Alan House, Scott Singleton, Stuart Kew, Shaun Smith, Alex Haste, Richard Jenkins, Jim Masters, Justin Quick, Neil Sear). We hope 2018 will bring as much drama and excitement. If your business is interest in playing next year, please get in touch or keep an eye out for information next year.